“This dessert is so sinful!” I would hear my friends exclaim before digging into their sugar and flour laden dessert. But it doesn’t have to be so. Dessert can be a healthy treat. I always try to pick desserts made from nutritious ingredients like fruits, vegetables, nuts and grains. 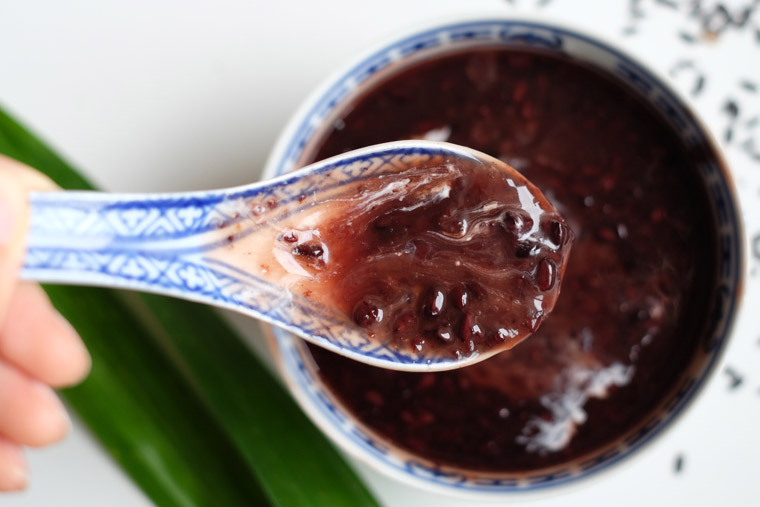 Naturally, I prefer Chinese and Malaysian desserts which feature natural ingredients like pomelo, sago, tapioca, coconut milk, and black glutinous rice. Think of mango and pomelo sago, kuih bingka and bubur pulut hitam (黑糯米). I think they are equally, if not more, delicious than cakes and pastries. This nutritious dessert is a rich source of antioxidants – much more than blueberries! The only caveat that it normally takes a long time to make and need constant monitoring. The best way is to toss all ingredients into your slow cooker before you sleep at night. 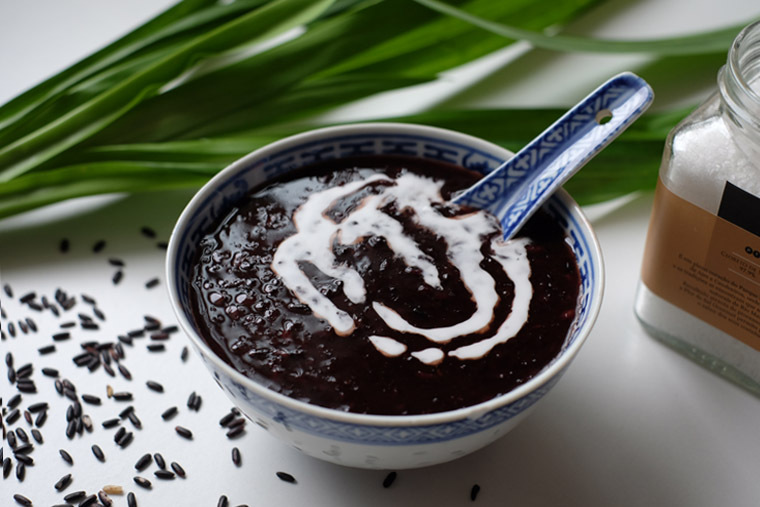 Leave it to cook overnight and enjoy a delicious pot of bubur pulut hitam the very next day! Step 1 Toss black glutinous rice, pandan leaves and water into the slow cooker. Step 2 Slow cook on high for 6 hours. Step 3 Remove the pandan leaves. Then add gula melaka and mix well until it dissolves. Step 4 Add a pinch or two of salt. Step 5 Dish out into individual bowls. It’s delicious on its own. But if you like your dessert to be richer, drizzle with coconut milk. Toss 1/2 cup glutinous rice + 2 pandan leaves + 3.5 – 4 cups water into the slower cooker. Cook on high for 6 hrs. Remove pandan leaves. Add 80 – 100 g gula melaka. Mix well to dissolve. Serve with coconut milk + a pinch of salt. I usually dry roast the glutinous rice before adding water. This extra step would release more of its good aroma. However, most people are not sensitive enough to notice the subtle difference so you can skip this step. I have an Instapot (the Philips All-in-one Cooker) and I normally cook mine with that. It allows me to dry roast the rice before slow cooking it. The consistency for this recipe is more thick than watery. I’ve tried cooking it many times for this consistency which to me is just right. If you prefer your bubur lighter, do add more water; use 1000 ml (or another 1/2 cup) instead of 875 ml. I normally make it right before I sleep and have a bowl for my breakfast. It’s very filling! If I have extra, I’ll pack it into small containers to freeze. I normally only use 80 g of gula melaka. I think the sweetness is just right. For my own consumption, I put even less. If you like it to be sweeter, you can add more. Perhaps another 20 g of gula melaka. After reading the book Salt, I’ve become a salt snob…I like my bubur served with generous amount of coconut milk and a pinch of fleur de sel sea salt to tantalize the tastebud. How long did you cook it in your Instapot? Hi Joann. As I don’t normally soak the rice overnight and like to roast the rice before hand, I use the Instapot SLOW COOK function and cook for 6 hours on HIGH. However, if you want to use the PRESSURE COOK function, try soaking the rice overnight and pressure cook for 30 minutes.